I was like a kid enthralled at all the goodies that Rustan’s had. One thing that caught my eye was this cube with different colored papers inside. A closer look would reveal “Table Topics”. This appealed to me and would be a hit with my outgoing-game-loving friends and relatives. It’s a great game around new people and another way to add spark to familiar relationships. You’re bound to learn something new about someone. It’s a cube that has remarkably intriguing and interesting questions where people take turns getting a card and answering the question on the card. These cubes have expanded from the Original Series to specialized cubes like Table Topics College, the 80s, Gourmet, Girls Night Out, etc. 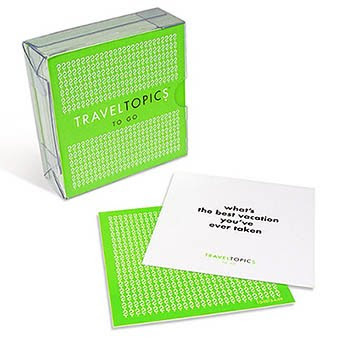 The company has also released a skinnier version of the cube called “Table Topics To Go” with categories like Travel, Wine, Pets, Etc. Drool while answering these questions from the Table Topics Gourmet Cube. I’m pretty sure a lot of girls WILL make their S.O. (significant others) play the Couples Edition. 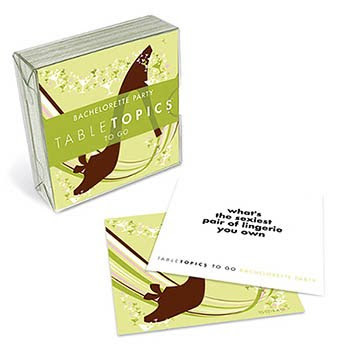 Make your Bachelorette Party more interesting with Table Topics To Go. "If the bride could get rid of any of the groom's possessions what would it be?" "If you could be romantically connected with any celebrity who would it be?" 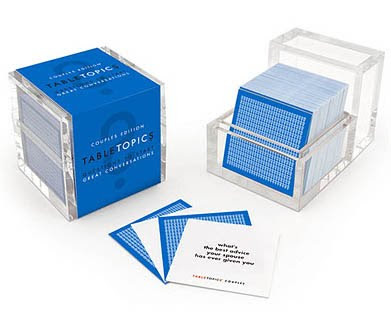 Which Table Topic Cube/To Go set would you want to buy first? Table Topics To Go P825. * Additional photos and text from the Table Topics website.